ORLANDO — Like most award ceremonies, former winners of The Bowerman Award return to hand over the hardware to the current recipient. When it comes to the women’s version of The Bowerman Award, Jenna Prandini (2015) received hers from Laura Roesler (2014), who received hers from Brianna Rollins (2013), who received hers from Kimberlyn Duncan (2012), who received hers from Jessica Beard (2011), who received hers from Queen Harrison (2010), who received hers from the original winner, Jenny Barringer (2009). As the years pass and there are more former winners of The Bowerman Award, it means more former winners can return for The Bowerman Award Ceremony. Well, this year, six former winners of The Bowerman Award come back to take part in the proceedings — Prandini, Roesler, Rollins, Duncan, Beard and Harrison. 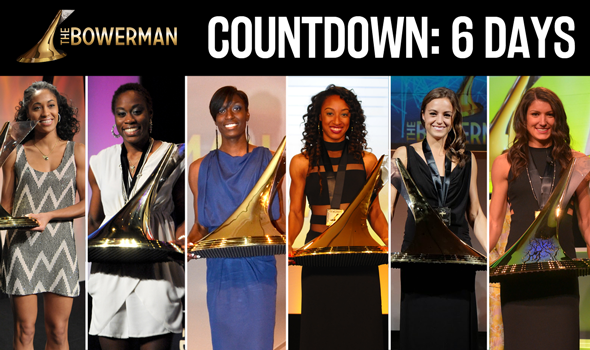 It just so happens that six days remain until The Bowerman Award Ceremony on December 16 at the Orlando Grande Lakes Resort. You can watch the ceremony LIVE, exclusively on FloTrack starting at 7 p.m. ET. Be sure to check out TheBowerman.org throughout the week leading up the big day on Friday.